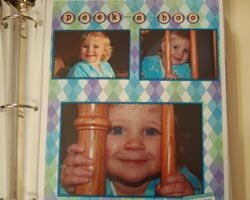 How to Scrapbook: Putting it all Together! How to scrapbook? There's no right way to start making a scrapbook page. Everyone has their own technique. But if you really are stumped on how to begin, maybe you'll find some help in reading how I make a page. I begin by gathering all my photos related to an event and cropping them. The term cropping simply means to cut your photo to only include the subject and/or what is important in the photo. However, not all photos should be cropped. Some photos are so beautiful nothing should be cut out. Use your judgment. Cropping does two things. It allows the photo to be made smaller so that more photos can fit on a page. See how many photos fit on the 8.5"x11" page shown below? Cropping also makes the photos stand out by showing the subject clearly and eliminating anything distracting in the background. 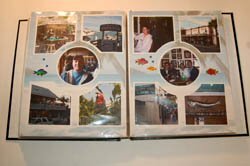 I often use my plastic template stencil to cut my photo into an oval, smaller rectangle, etc. After I have all my photos cropped, I choose a background paper. The patterned pages are nice, but more often than not I choose a solid color of cardstock as my background. To choose the color to use, I look at all the photos I want on the page and see if there are colors that stand out. If the person is the photo is wearing a blue shirt then a blue background would look nice with them. 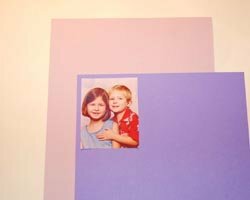 Next, I pick another complementary color of cardstock that goes well with the background paper. It may be another color that appears in the photos. This cardstock will be used to mat the photos. I place all the cropped photos on the piece of cardstock, in whatever way they fit best, and glue them down with the glue stick. 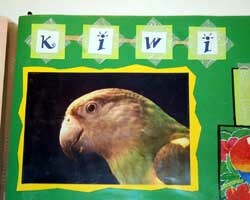 Then, I cut around the photos leaving a thin border of the cardstock to act as the mat. When all the photos are matted, then I arrange them on the background paper in a way that they all fit well and is pleasing to the eye. Make sure you leave room for a title and some journaling too. Once you have it layed out right, glue the photos down. Next it is time to add a title and journaling to the page. It is important to add the date and to identify who is in the photos. 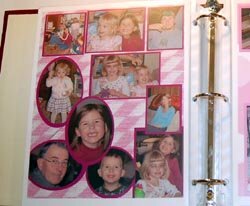 Family members generations from now may look at your scrapbooks and want to know who the people in the photographs are. You can use the fonts on your computer and print right on your cardstock to add titles and journaling, or write it out by hand with a marker. There are also some great websites with wonderful ideas. 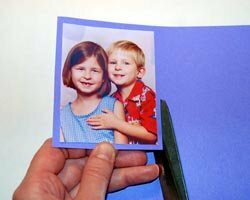 Scrapbooking takes some time and patience but it can be a very relaxing and enjoyable hobby. You will feel so proud that you are preserving your memories for generations to come!